Utilizing computer-aided terrain modeling, the roof is a non-parallel extension of the landscape below. It has been digitally enhanced to provide a unique porous stratum in which the volume of the house exists. These volumes, in turn, act as extensions of the ground which gracefully float out across the site. The digitally conceived roof above allows space within the house to compress and expand as it collects light and exposes views. The light is encouraged to wash over the concrete surface exposing the subtlety, elegance and delicate nature of the curves. Like a jigsaw, the roof and landscape interlock so as one moves through the house there is an ever-shifting viewpoint between solid and void. It is the juxtaposition between natural and digital through which patterns and rhythm’s become activated by the property’s natural setting. 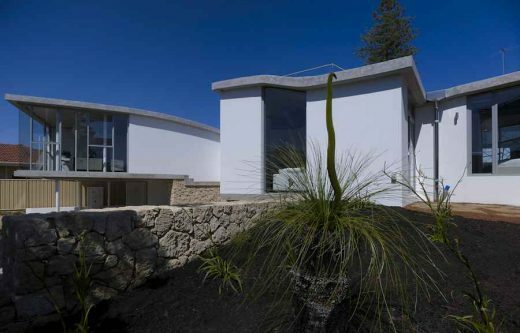 The three bedroom, two bathroom, two living room house branches out across the site as if the residence was a swathe of earth in the site from which it emerged. Two separate interior living areas inhabit the extremities of the residence’s arms and are united only by the fluid concrete roof above. Toward the west side of the house are the bedrooms and bathrooms. Here, the private program is implanted onto the ground, acting less as a spectacle, establishing the residence’s primary attachment to its site. As one moves through the space they encounter the continuous concrete roof, offering a lens through which you can read the volumes as they unfold across the land. On top of the roof is a viewing deck. An expansive view is framed and complimented by the graceful undulation of the roof’s surface, simulating the surroundings in which it resides. The Aldrich residence exposes the beauty and lyrical nature of its context. The elegance of one uid gesture, the roof, animates the inhabitable volumes below. Light collects between the graceful branching extensions of the residence creating a symbiotic dance between the interior and exterior. It is the roof that guides the project; it provides volume, movement, and continuity throughout. It is the roof that unifies the Aldrich Residence to the earth.